I hope you all had a Merry Christmas and Happy Holidays. Coming from a typical Canadian family, we carried on with a mishmash of traditional Western celebrations tracing back to 4 separate cultures: tortierre (French), vinetarta (Icelandic), turkey (English) and whisky (Irish) as well as engaging in several bizarre rituals such as cutting down a tree and planting it in our living room, decorating it and placing gifts under it. My parents gave me a tent and a new fishing rod, as well as several shiny new lures. My uncle and aunt gave me a great book about advertising in the 50s. Back then, the best copywriters were the sons of preachers, strangely enough. 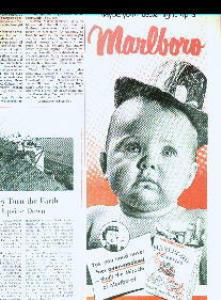 There are a few alarming ads depicting little babies looking sadly up with the copy, "Before you scold me mom, light up a Marlboro". There were ads for Camel that made 'sure you never feel over-smoked' and ads for booze to make you 'the life of any party'. The whole book is such an interesting statement and yet mere cultural mirror of the time. The ads portray an ideal. People are attracted to their own ideals. It draws them in. Envy could be argued to be the root of attraction. Being slighlty obsessed with advertising, I couldn't help but make the parallels between the lures and the book. Essentially, that is our job, to make the shiny bait that catches someones attention and hooks them into a new perspective. The ethics of how this is done now, as opposed to the 50s is a statement of the times. We live now in arguably more enlightened times. At the risk of appearing pedantic, I should point out that the goose is really the traditional English Christmas meal, although the poor were more likely to dine on chicken or blackbird. The first turkeys were imported from the Americas in the sixteenth century, but only really took off as the Christmas meal of choice in the last 100 years or so. Turkeys in England were - and still are - raised on specialist farms, in contrast to the US, where the native bird was often part of the family flock. As for alcoholic beverages, if you have Irish origins, surely you were drinking whiskey rather than whisky, the Scottish spelling. pedantic? haardly. In fact we were drinking McGinty's finest, so I didn't know about the spelling bit. However! I have heard that the Turks actually brought the turkey to England some hundred or so years ago (thus the name), and that is how the tradition began..